Pinamar is a tourist locality placed in Buenos Aires province at the Atlantic Ocean, at the southeast of Capital Federal. 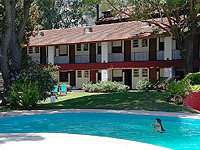 One of the best advantages of Pinamar, as a tourist destination in any season, is that it is only 340 km. far from Buenos Aires, arriving through a safe, fast and nice route. 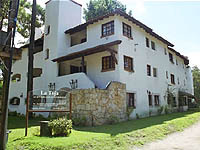 You can also arrive by train, bus or plain at close airfield of Villa Gesell. The climate of the region has typical coastal characteristics, great for human settlement and also for vegetation well-growing in the shape of forests, due to the relative humidity. The sea currents are warmer than the average due to the deviation from Cabo Corrientes that affects the cold currents that come from the Antarctica and circulate along the Argentine Coast. This fact, in addition to the balance of slopes not so deep and the wide spaces between tides, makes these beaches ideal for bathing use. Although in Pinamar the sun always shines, it also become dark and Pinamar transform itself. Discos, Piano Bars, Cinemas, Theatres, Festivals, shows, Video Games are available for the tourists to give life to night. Casino and amusement arcades are other attractions that can be enjoyed by the night-wanderer visitors. Cabañas en Pinamar. Información detallada, imágenes, precios y descuentos de Cabañas en Pinamar. Excelentes ofertas de Cabañas en Pinamar. Detalles e información de alojamientos en la ciudad de Pinamar. Cabañas , Aparts y spa para disfrutar de las vacaciones junto a toda la familia. Consulta los precios de cabañas en Pinamar. Tenemos el listado más amplio de Cabañas y Aparts baratos en Pinamar y alojamientos de primera categoría. Además, información de excursiones, paseos y rutas gastronómicas.